able to grow to become happy, educated women too. Last week one of my Stanford little ones sent me an email imploring me to support the #BringBackOurGirls campaign through a Change.org petition. This cause is particularly close to her heart as like the girls abducted from Chibok Secondary School, she too is not only Nigerian, but also from the Northern region and Muslim. She has benefitted from the power of education with it taking her to boarding school in England and to one of the best universities in the world. She is able to be whoever she wants to be and has never been restricted by her faith or her gender. She has blossomed uninhibited to be an accomplished independent young woman, in large part due to the support of her family in her endeavours. To witness what has happened at the hands of Boko Haram must be a pain that is particularly acute for her to bear. I immediately obliged and then thought what more can I do. I had already been thirsting to know more, and was wondering why the world had not already covered it the way they had instantly reported on the recent MH370 plane crash, the South Korean Ferry disaster or the on-going political and ethnic unrest in Ukraine. I think that this issue of human rights and terrorism affects the world as it brings to the fore the issue of human trafficking which has been plaguing world for centuries (albeit in different forms over time) and deserves the same coverage, if not more. These heinous actions have now gone completely underground, yet millions of adults and children are plucked from their homes all over the world every year and sold and/or forced into some sort of servitude unbeknownst to the average world citizen. Boko Haram knew this and completely exploited this opportunity to pluck girls so brazenly from the safety of their boarding school, and are proudly talking about this diabolical act and how they seem to have gotten away with it. Pop culture has taken a stab at bringing this issue to light. In Taken, a cult mainstream film, Liam Neeson's daughter is abducted in Paris and is drugged and sold for a rich man's entertainment aboard his yacht. He turns over every stone to find her in a manaical rampage. I recently watched an indie, I am Slave, about a Sudanese girl who is stolen as a child and taken all the way to England with the family who own her. They give the impression she is employed as a maid, but really has been taken against her will, and has grown up unpaid and worked like a horse. Both movies rocked me to my core. The thought of things like this happening as we go about life is extremely troubling and scary. There are so many layers to our world, many unseen, sinister, and dangerous. None of the girls are so lucky as to have a CIA trained father to use his contacts and experience to free them, and luckily some of the girls were able to escape like the girl in I am Slave was eventually able to do. Fortunately, they have parents who love them, who are outraged that the Nigerian government and military did nothing to protect them even though there are reports that they were forewarned. 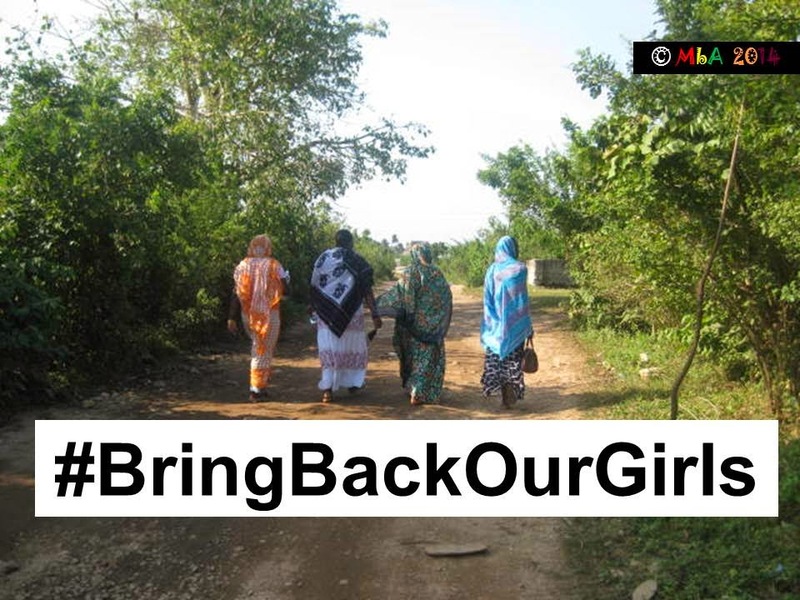 They started a social media campaign on Twitter through the hashtag #BringBackOurGirls. It has taken weeks for the world at large to respond. Now the news is filled with colourful images of mothers in mourning. I wonder whether they may have found comfort sooner, if Nigerian and global support had come earlier. I have just heard about an event here in Lusaka to be held this Saturday, 17th May, from 09:30 to 12:00 at the Civic Centre. The hope is to get Zambians more involved in helping and being more informed about the current situation and the larger issues the Chibok girls have brought to light. There will be children marching in support and various knowledgeable people speaking about the issues at hand. I will write more about this after the event and once I know more about what we are doing here in Zambia. In the meantime, you can keep abreast with all information, social media and petitions to do with the Chibok girls at BringBackOurGirls.com and about the Zambia Cares campaign here.